Dan Clarke built his truck for the 2.6 class but after tuning the truck on his dyno he realized that he could also be competitive in the 3.0 class. The biggest problem was he would have to pull in 2.6 class and then drive straight back to the scales so he could weigh and tech for 3.0 class and then pull without any cool down time. Event after event Dan's truck proved how dependable his truck was as he took 1st place in Georgia and 2nd place in both the Colorado and Indiana events, but as he headed to the World Finals he was trailing the points leader Tom Hansen buy 8 points so once again it would come down to who would do better at World Finals. Hansen drew the #1 position and Clarke drew the #5 position. 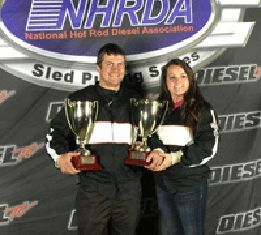 Hansen pulled 291.10 feet which was a good pull, but when it was Dan turn he laid down a 315.05 pull to beat out Tom Hansen and take home the National Championship in the 3.0 Class Congrats to Dan and Dan's Diesel Crew!